본 연구는 격구의 본질적 의미 파악을 위하여 무예사적 연구를 중심으로 살펴보고자 하였다. 격구는 Polo 경기의 형태로 조선 전기에 무과시험으로도 행해졌다. 특히 이론적인 틀거리 및 사료 중심의 연구한계를 벋어나 실제로 다양한 擊毬 자세를 복원 및 연구하며 얻어진 실기적 내용을 더하여 보다 무예 원형적인 의미파악에 주력하였다. 이를 위하여 격구 뿐만 아니라 조선시대 기병들이 훈련했던 馬上月刀나 馬上鞭棍 등 핵심적인 馬上武藝와의 실기사적 비교를 통하여 擊毬의 무예사적 특징을 집중적으로 살펴보고자 하였다. 擊毬의 무예사적 특징은 첫째, 당대 기병전술 활용을 위한 武官 육성을 위한 것이며, 둘째 경기 방식과 1인이 단독으로 펼치는 擊毬 모두 觀覽形 무예로 자리를 잡았다는 것이다. 셋째 격구의 관람형 특징으로 보급 및 확산의 속도가 빨라져 민간에서는 말을 타지 않고 땅위에서 공을 치는 골프형의 놀이로 발전하는 계기를 만들었다는 것이다. 마지막으로 조선전기에 활발하게 보급되었던 擊毬가 조선후기에는 馬上鞭棍을 비롯한 실전형 무예로 교체되면서 기마전통이 유지되었다는 것이다. 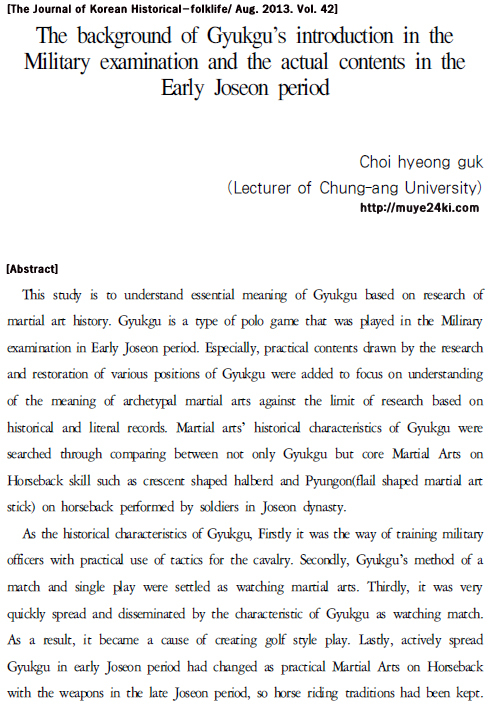 This study is to understand essential meaning of Gyukgu based on research of martial art history. Gyukgu is a type of polo game that was played in the Milirary examination in Early Joseon period. Especially, practical contents drawn by the research and restoration of various positions of Gyukgu were added to focus on understanding of the meaning of archetypal martial arts against the limit of research based on historical and literal records. Martial arts’ historical characteristics of Gyukgu were searched through comparing between not only Gyukgu but core Martial Arts on Horseback skill such as crescent shaped halberd and Pyungon(flail shaped martial art stick) on horseback performed by soldiers in Joseon dynasty. As the historical characteristics of Gyukgu, Firstly it was the way of training military officers with practical use of tactics for the cavalry. Secondly, Gyukgu’s method of a match and single play were settled as watching martial arts. Thirdly, it was very quickly spread and disseminated by the characteristic of Gyukgu as watching match. As a result, it became a cause of creating golf style play. Lastly, actively spread Gyukgu in early Joseon period had changed as practical Martial Arts on Horseback with the weapons in the late Joseon period, so horse riding traditions had been kept.